When you purchase a Pebble product, you are helping poor women in Bangladesh support their families and keep them together. Helping women out of poverty and putting smiles on faces worldwide! The company makes beautiful toys and creates dignified employment. Hathay Bunano aims to provide employment which fits in with the rhythm of rural life, stems the tide of economic migration to the cities and keeps families together. 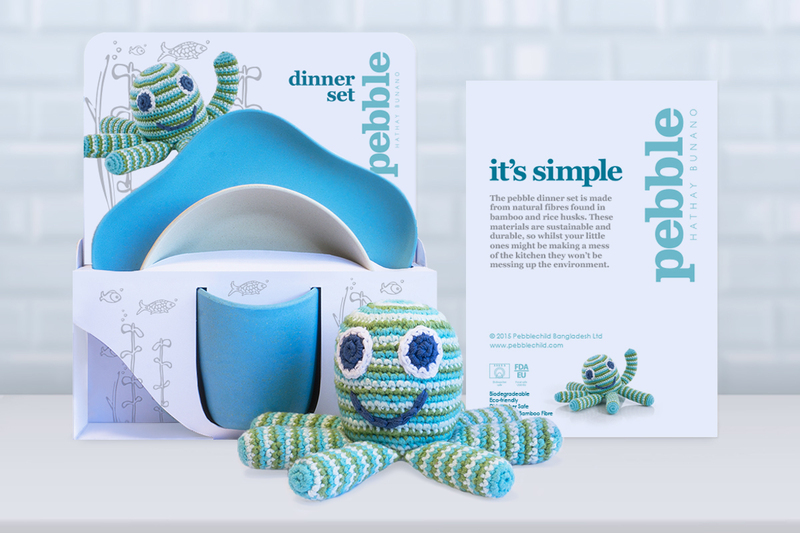 Design Inc has been providing a range of 2D and 3D design services to Pebblechild including branded packaging for these well designed and ethically manufactured soft toys. Being a sustainable business the green credentials of the packaging materials as well as the products is a key area of concern for our client.The characters developed as soft toys are used in other giftware ranges and there are plans underway for them to also being brought to life in a series of storybooks. To speak to one of our consultants about branded packaging please call 01784 410380 and speak to our Client Services Director Frank Norman or email. To visit our portfolio including more examples of branded packaging please click here.